The F. Skiddy Von Stade estate designed by Cross & Cross c. 1914 with extensive alterations by Peabody, Wilson & Brown c. 1930 in Old Westbury. These pictures were taken on two different days early last year roughly six months before the subdivision work began. Click HERE and HERE for more on the Von Stade estate. More to follow. after yesterdays post.this is a very sad site to wake up to ( I check the blog , everyday , first thing ). I used to know some of the family and can only imagine how sad it must be for them. It is all just so odd and sad. As for Bogheid, though, aren't other forces at work there than intentional neglect? My impression is that Mr. Carey likes having grand houses, but lacks the means and mental stability to keep them repaired, and that a combination of ego and stubbornness, rather than actual planned intent are at work there. 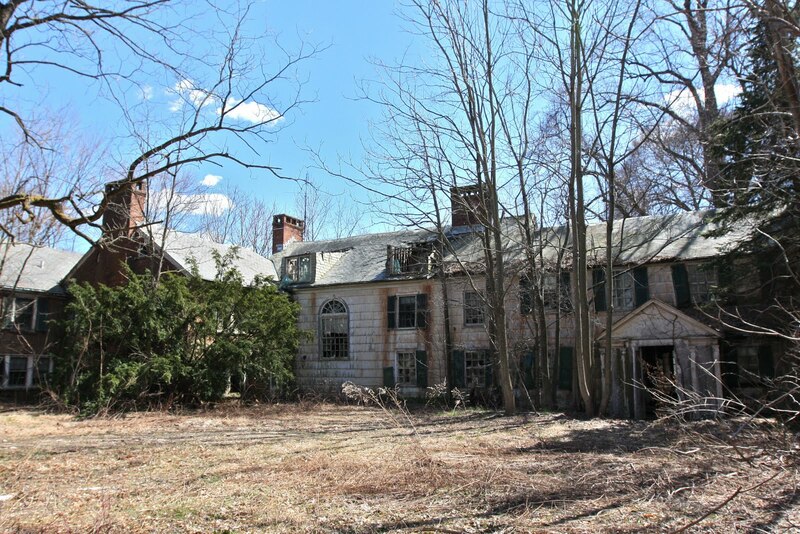 How many properties are there in Old Westbury (and adjacent towns) where people still keep horses? 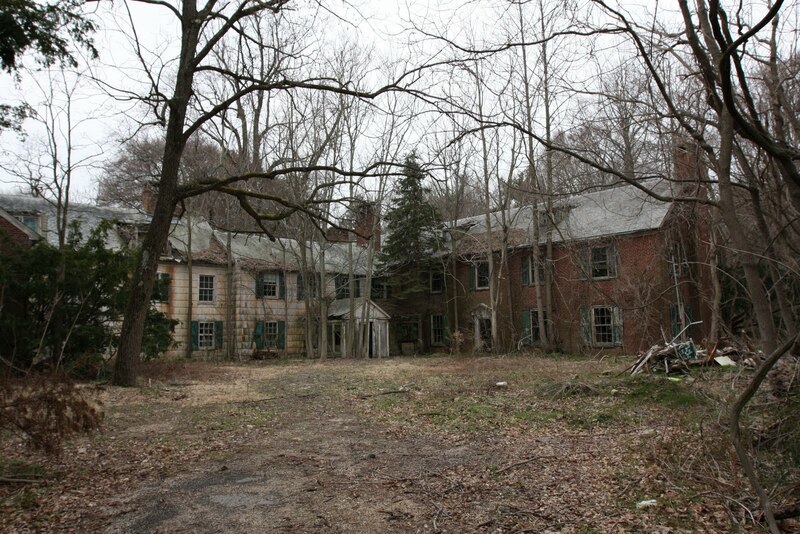 As for Old Westbury there are probably 10-15. A few big privates estates still do (Arlough, Groton Place, the stables at Spring Hill) and some smaller houses here and there that have 2 or 3 stalls and a ring in the backyard. As for adjacent towns... the Brookvilles (Old, Upper etc.) definitely have a bunch. The Bogheid mansion looks like a public dumping ground with old cars, trucks, boats and debris piles. Maybe there is a feud with the city owned golf course surrounding the home, but one would have to be totally disfunctional to think that is normal living, plus the house looks unoccupied. If unable to make logical judgements himself he must have keepers who are complacent? The heirs may be looking toward the future which may also be a major factor in the current dilapidated state the home is in. It begs the question - when did it pass from the Entenmann family? I'm assuming the manor house was almost never used once the covered exercise horse ring was built in the 1980's and so close to the house. 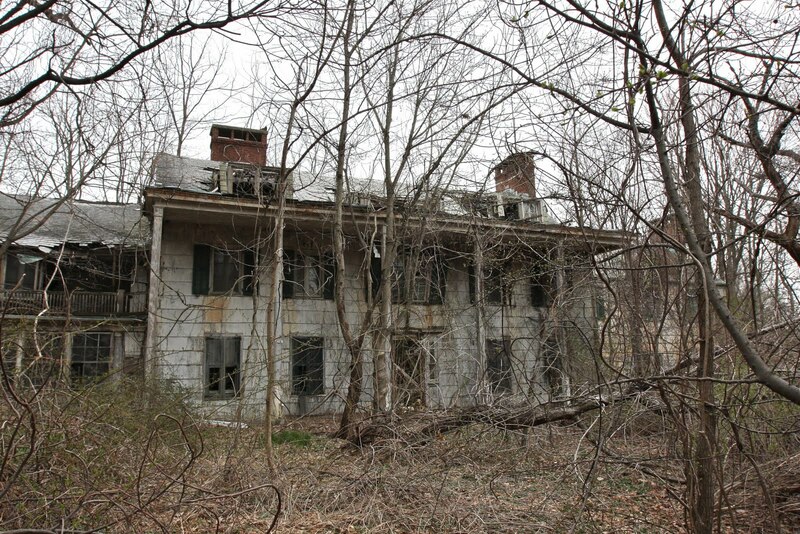 Obviously as others have rightfully lamented this property has found the end by intentional neglect which is just as severe as taking action to alter its look. As far as the subdivision is concerned...a developer had purchased the estate back in the boom days and filed plans for a subdivision which were approved by the Village. He then lost the property in foreclosure and it was picked up by another developer who is seeing the project through. It had been for sale (post foreclosure) along with the approved subdivision plans for at least a couple of years. I find the state of this house obviously very sad, but also quite fascinating. It has a "Life after People" quality in the way it has begun to collapse into itself and return to nature. How temporary everything really is. The interior photos linked yesterday were haunting. I am grateful for the pictures posted here yesterday of the house in it's prime. I had never really understood how it fit together from the the current google and bing views, but now have a greater understanding and appreciation of it. I still find it odd that the center section is subordinate in scale and material to the brick wings and every elevation seemed to have a "front door" delineation, but taken as whole it had a genteel, comfortable quality to it. What sorrowful neglect. Are there any bridle paths left in Old Westbury or the Brookvilles for those who ride? Seems a dangerous town to take horses on the road...people drive like mad-hatters on the small winde roads. Oh yes, Old Westbury itself has something like 30 miles of horse trails which are maintained by the Old Westbury Horsemen's Foundation. I know Brookville has quite a few as well as does Muttontown (you can ride the Muttontown Preserve and adjacent 'Nassau Hall'). As for Carey, I am a near neighbor of Winfield Hall and the mention of his name makes me almost apoplectic. There is clearly some sort of mental illness at work. This is no surprise to anyone who has seen the state of his properties, but it is apparent in spades, as they say, when an attempt is made to deal with him on practical matters. He and his wife live in a world of unshakable delusion where, to their eyes, their ramshackle properties are things of magnificence and beauty, daily accreting value as the rest of us see them sliding into irretrievable ruin. Having dealt with one of their children, I also fear that their "quirkiness" may have a genetic component. What about Underhill Farm? According to the segment on this house on "Off Limits," a tv show on the Travel Channel, the house appears to be abandoned. It looks as if a renovation was stopped midstream. Let's home the same ruination doesn't occur to this house. Anybody have any info? I provided the photograph of Myron Taylor to one of the producers of 'Off Limits' for that episode, I was told that it had been purchased by a family with plans to restore it. I cannot however comment on the accuracy of that statement. 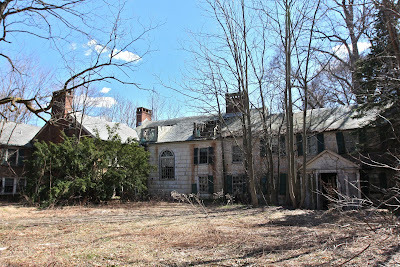 It had previously been owned by the Episcopal Diocese of Long Island. The current status of Underhill Farm is sadly a case of biting off more than one can- or rather wants to- chew. The current owners, full of enthusiasm and good cheer, and armed with some preliminary estimates and engineering reports purchased the property with every intention of restoring it to its former glory. Its fortress like construction, not evident in photographs or to those proffesional who took an initial look, thwarts them at every turn. A small example is a 7 figure estimate received for ductwork for a new HVAC system. And that paled in comparison to the price of a much needed new roof Other estimates have been similarly mind and purse bending. My understanding is that the whole enterprise is very sadly being rethought. It's a shame, as the owners have both wonderful taste and a wonderful sense of history. Nassau County Assessment records show the last property sale was in 2006 and no further activity. It would appear accurate that the home was purchased then, renovations got underway and then stopped during the recession. The records have the home built in 1738 (the original Underhill homestead) and last remodeled in 1939. 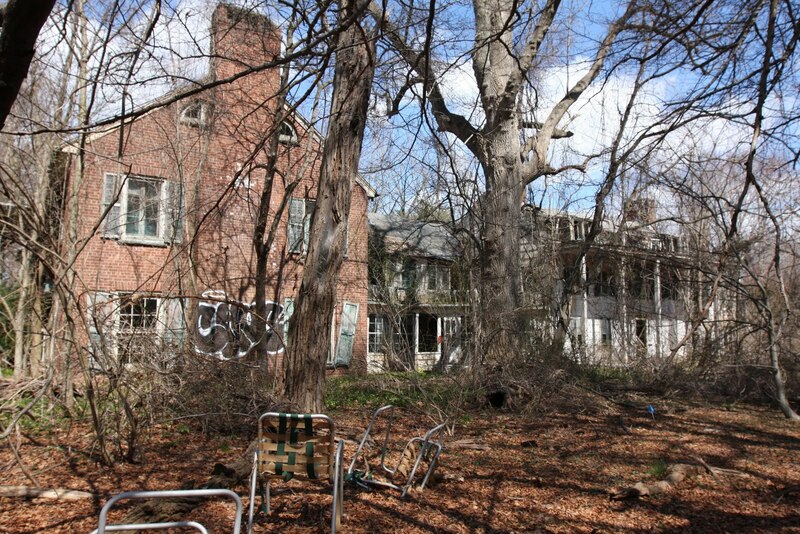 There is an auxiliary home on the property so hopefully there is someone on the grounds. The mansion has some unique interior rooms so hopefully renovations restart or the home is sold to a sympathetic buyer. In response to Magnus's comments, That renovation story is why so many older homes are falling to the wrecking ball. Contractors when faced with such "bunker" construction inflate their estimates to account for any unforeseen obstaclse. Also when they are called upon to renovate a mansion, they easily presume the owner can afford their job quote. Adding the most basic conveniences requires major demolition and routing thru steel and concrete. As a broker stated in the NY TImes article describing why the developer Brodsky was tearing down Lands End, she said "buyers are looking for immediate gratification, there is no appetite for renovating" A very sad commentary on the future of preservation in this country. I myself would forgo some of the luxuries and concentrate on the roof issues and making the home habitable first. Perfect interior restoration and interior design can wait. Leaving the home in its current condition will not help whether they move forward with renovations or try and sell it. 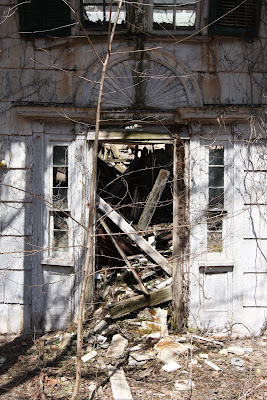 I also always thought there has to be a way organizations like SPLIA and a college like NYIT which has an architectural program could get together with such an owner and set up an apprentice program so students can renovate a property hands on and properties in need of restoration can be salavaged. I think SPLIA had a revolving home restoration program at one time, but it was dropped many years ago. The School of Architecture in Savannah has such a program. I'm confused about the length of time this house has been sitting empty. If there was a school there as late as 1997, it has been deteriorating for a little over 10 years? These pictures fascinate me too. I am actually surprised at how little graffiti there is. I can't seem to find "Underhill Farm" when I do a search on OLI....does anyone have a link to the estate? Thankyou Zach. That's why I couldn't find it, I was typing in "Underhill Farm" not knowing it was the same as "Killenworth". Wait...what was I thinking..."Killenworth" cant be "Underhill Farm"...is that the correct link Zach? You're right...Killenworth is not Underhill Farm. You read a little too quickly... it's Killingworth. The Myron Taylor estate was not previously owned by the Episcopal Diocese. It was sold by the Diocese around 1981 to a couple who sold off most of the acreage in lots. (Guessing Eastern Europeans?) Hence the very awkward lot Killingworth presently occupies.